The market weight for meat goats in the US is quite variable; however, sale weights near those typical of weaning time are common, possibly relating to the amount of disposable family income and yield of a quantity of meat suitable for consumption in a convenient period of time such as 1 or 2 weeks. Also, some consumers may prefer meat from young animals. Thus, means of enhancing growth of meat goat kids preweaning and in the early postweaning period is of interest to increase income for meat goat producers. In this experiment, Spanish does with Boer × Spanish or Spanish kids were used to determine effects of preweaning feeding of concentrate-based supplement on preweaning and early postweaning growth. In mid-April, from approximately 6 to 14 weeks after birth, animals grazed wheat forage (Phase 1), followed by 5 weeks on native grass pasture (Phase 2) and an 8-week postweaning period with a moderate level of supplemental concentrate (Phase 3). Forage availability was moderate to high throughout the experiment. Treatments were no supplementation in Phases 1 and 2 (C), ad libitum consumption of a concentrate-based supplement in Phases 1 and 2 (A), no supplementation in Phase 1 and ad libitum consumption of supplement in Phase 2 (A-2), and limit feeding of supplement (approximately 1% of body weight, dry matter basis) in Phases 1 and 2 (L). 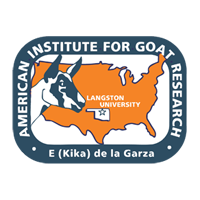 Results indicated that with ample availability of forage of at least moderate quality as in Phase 1, suckling meat goat kids may not quickly achieve high levels of consumption of concentrate-based supplement. In accordance, preweaning supplementation did not enhance preweaning growth while grazing wheat forage or later when on warm-season grass pasture, regardless of growth potential as influenced by Spanish and Boer sires. However, preweaning supplementation generally did improve growth in the early postweaning phase with a greater level of supplementation than previously. Nonetheless, preweaning supplementation did not impact overall gain in the entire experiment.